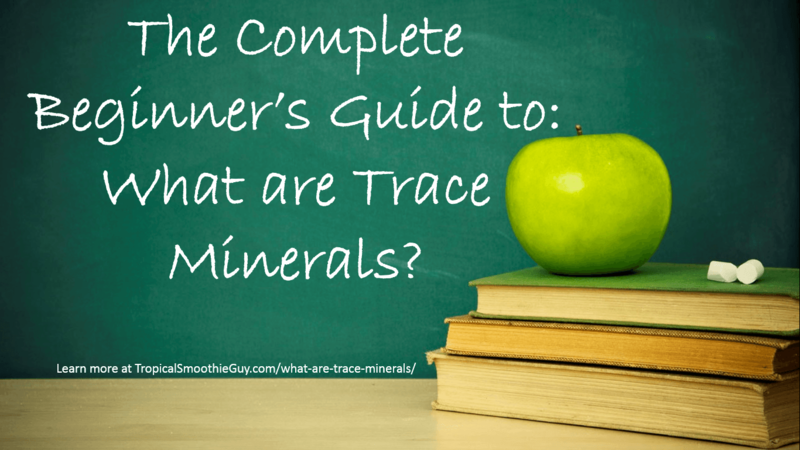 The Complete Beginner’s Guide to: What are Trace Minerals? What are trace minerals? This blog review will cover the basics of what trace minerals are and the supplement I’ve been using for over a year and have seen some positive results. Let’s get started. Did you know that the modern agricultural practices of the past have depleted most of the naturally occurring minerals in our soil? That’s right, even people who eat 60% or more of raw and organic whole fruits and veggies may still need supplementation in the form of trace minerals. Everything that happens in the human body needs trace minerals. This includes 74+ minerals, amino acids, and vitamins. Most of us are mineral deficient which can cause everything from issues with waking up, staying awake during the day, to issues falling asleep at night. The problem is that most trace mineral supplements are rock derived and have a low absorption rate (bioavailability) by the body. The good news is that fulvic acid is one of the most bioavailable form of minerals and is sourced from ancient plant deposits for best results. When looking for a trace minerals supplement, choosing one that contains fulvic and humic acids from a plant based source is very important. These two are the most highly concentrated raw ingredients available today. Fulvic and humic acids (and the nutrients they bring to the table) come in the right amounts, are organic, and come in an ionic form that your body can easily receive and benefit from (like a close friend who gives you a greeting card). Some people have even experienced better nail growth from using trace minerals. It’s important to start with a lower dose of trace minerals due to the strong cleansing function of humic acid. You’ll want to always take this supplement with chlorine-free water and wait anywhere from 30 mins to 1 hour between taking any medications or other supplements (to be on the safe side). This is because fulvic acid has the ability to open up cells better for more absorption, which could potentially cause some issues with other things you are using. The good news is that you may be able to minimize or eliminate other medications or supplements over time with permission from your doctor as your symptoms get better. What Are Trace Minerals Made Up Of? Trace minerals are found in varying amounts from batch to batch since it’s an organic product and is naturally taken from ancient plant deposits deep inside the earth. Fulvic and humic acids contain trace amounts of minerals, vitamins, amino acids, and electrolytes. The true value comes in how the nutrients are given to your cells rather than the specific amount of any one nutrient that is present. The GSG Trace minerals supplement comes in a 4 oz. glass bottle with a dropper for convenient dosing and serves as a powerful addition to smoothies, juices, or chlorine free water. It’s also virtually odorless and tasteless, which is nice since it basically takes on the flavor of whatever you mix it with. Last, but not least, it’s vegan, free of allergens, yeast-free, soy-free, gluten-free, and nut-free. The first thing to do is check out my other blog reviews on supplements that can take your smoothie or juice to another level from a taste and nutrition standpoint (see related posts below for more details). When you are ready to but some, feel free to send me an email at TheTropicalSmoothieGuy@gmail.com and I can walk you through the easiest way and help you save 10% on your order.